Should Your Business Invest in Fiber Internet? Imagine your business lost its internet connection. Could you honestly fulfill any of your business functions? When the internet goes out, most employees twiddle their thumbs at their desks until it’s fixed, creating costly downtime. Yet businesses still put up with issues like a slow connection or wi-fi drops as if they’re just a part of life. If these internet problems sound familiar, you may have considered a more premium solution than your basic internet connection for your business: fiber internet. Fiber internet connections promise a much higher quality internet solution, but how much of what you’ve heard is true? Let’s go over how to decide if a fiber internet connection makes sense for your business. A technology that uses glass (or plastic) threads (fibers) to transmit data. A fiber optic cable consists of a bundle of glass threads, each of which is capable of transmitting messages modulated onto light waves. As thin as human hairs, these strands can carry digital information over impressively long distances. 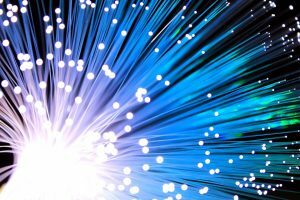 Businesses invest in fiber due to its greater bandwidth capabilities than copper cables. Furthermore, fiber cables are less susceptible to interference and are much thinner and lighter than copper cables. This allows data to be transmitted digitally vs. analogically. The benefits are clear — fiber has an advantage over traditional internet. Unfortunately, fiber has a higher price point than broadband and can be more complicated to install. Now that you know about some of the pros and cons of fiber internet, it’s important to consider a few items before your business invests. Does your business always need to be connected? Standard cable internet is typically reliable in metro areas, but in smaller towns, it tends to be less consistent. On top of that, if your business is in a location that is prone to bad fits of weather, power outages may affect how often your internet is cut off. If this sounds like your business, you might want to consider fiber. Fiber doesn’t need power to be applied to the system network. Without the reliance on power, electricity outages won’t necessarily affect your internet connection. Business.org explains that because the conductor is glass, it does not generate electricity, so fiber is immune to interference that can be caused by nearby power lines or high-voltage electrical equipment. With fiber-optic wiring, there is less chance of your computer sustaining lightning-related damage. Furthermore, fiber is purchased with a service level agreement (SLA), meaning that you’re guaranteed to get serviced when your internet goes down. On the other hand, broadband is a best effort service, when your internet goes down, the provider will do their best to help fix the issue, but it’s not part of the contract. Can your business access fiber internet? Unfortunately, fiber isn’t available everywhere. The more remote your business is, the less likely you’ll be able to access it. Still, fiber’s coverage is expanding…slowly. This is because fiber requires a complete rewiring of new cables, which means changing old systems. Want to see if there’s a provider near you? Shoot us a quick message. We have a tool that provides businesses with a snapshot of fiber routes in the area. How badly do you need extra speed? Is your business responsible for continuously receiving and shipping orders? Does your website promise quick responses to consumer requests? How important a strong and fast internet connection is to your business will be your primary determining factor. If the cost of slow internet is higher than the cost of investing in fiber, then fiber is obviously worth your investment. You’ll want to work with a telecom advisor to determine if that switch makes sense. If you’re the type of business that absolutely needs the best possible internet connection and you’re in an area that supports it, you can’t go wrong with fiber. Though it can cost more than broadband, a constant, reliable internet connection is a significant benefit to most businesses. How much does an outage or slow speed cost you? How often does your current internet go out a month? We’ll run the numbers together and make sure a change to fiber is the right decision for your business. Contact us today, and we’ll get started working with all available providers to present you with their best offers and set up your final decision! ← Do Businesses Need Desk Phones Anymore?